NO LONGER SATISFIED with serving the traditional tiered treat, many couples are saying, “Let them eat cake some other time.” And we’re not talking about simply converting to cupcakes or throwing down a platter of iced cookies. 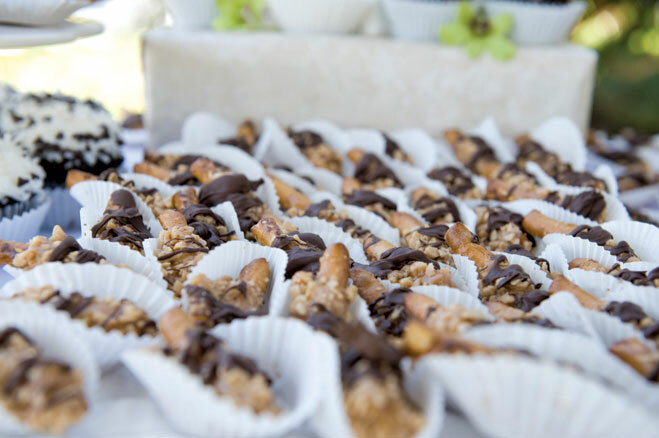 Caterers, bakers and dessert providers are deconstructing classics, shrinking sizes, choosing alternative packaging, adapting favorites and crafting confections on site to offer the ultimate in dessert decadence. 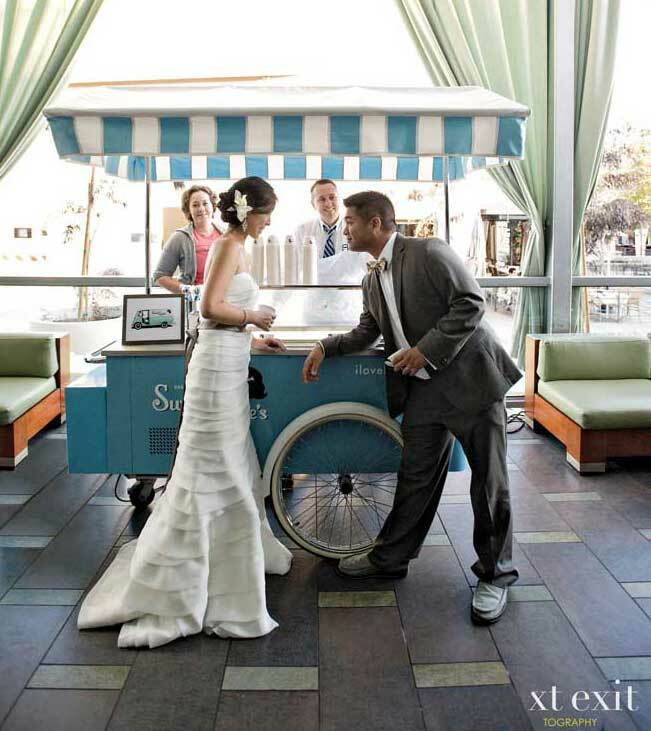 and half years ago, and has been serving her small-batch specialties from an antique cart and ice cream stand. This past spring, she restored a vintage ice cream truck that expanded her service boundaries from Santa Barbara to San Diego and out to Palm Springs. Everyday favorites such as cookies and cream, vanilla and butter pecan are available, as are exotic flavors, such as Earl Grey, Chai Latte and Creamsicle, plus organic sauces and toppings. Packages vary depending on number of flavors, guests, service hours, cart size and event location. Growing up, brothers Trent and Rhys Carvolth celebrated every milestone with their mom’s homemade cream puffs. In 2009, they turned their family tradition into San Francisco’s Pacific Puffs, using the cupcake-shop model and an adaptation of their mom’s recipe. The siblings bake, coordinate orders, make deliveries and often serve when a couple hires the Puff Truck. Go with the classic (vanilla custard topped with chocolate glaze or powdered sugar), chocolate, fruit whip or special flavors (amaretto cream, mocha, eggnog or peppermint). A cantaloupe-size pastry ($25) is available for “cake-cutting” or go for a croquembouche ($255). Small puffs are $2 each; large $3.25. Additional charges apply for delivery, display or truck rental, and coffee service. At tastings, Itty Bitty Sweets owner Page Bowman had noticed a lot of grooms didn’t care much for cake. But their eyes lit up at the mention of her caramel-dipped, toffee- rolled and chocolate-drizzled pretzel sticks. “I have them on hand, because they always win over guys and people without a sweet tooth,” says the Ladera Ranch‒based baker. Now 95 percent of her orders include the salty-meets- sweet snacks, which can be made with milk, dark or white chocolate, sprinkles or a cake- pop candy coating that matches the event’s colors. The pretzels are usually displayed in favor bags or serving dishes, such as cake plates and vintage tins. Sticks $1.75 each, rods $3.50. Additional charges for specialty tags, shipping or delivery. Pastry chef Linda Santoso started Li’l Puffs in Santa Clara in 2010, after discovering people were still talking about the artisanal marshmallows she served at her wedding a year earlier. 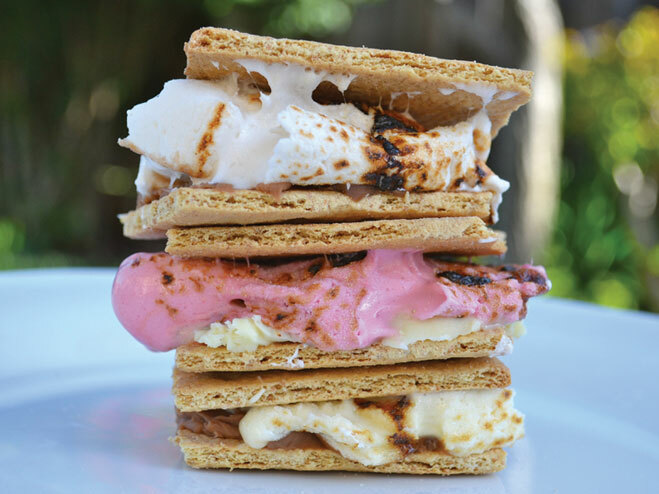 Now she creates 4-ounce bags of her melt-in-your-mouth cubes and offers marshmallow display and s’mores toasting station services in the Bay Area. There are no flavor enhancers, coloring or preservatives. Instead, she uses fresh fruit purées, Guittard chocolate and Nielsen-Massey vanilla extract to create the marshmallow squares of strawberry, passion fruit, cinnamon and other flavors. Custom toppings and seasonal flavors like peppermint, lychee and pumpkin pie fur- ther personalize your station. $12 per person, plus delivery charge. 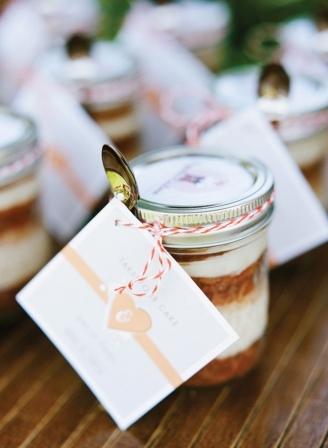 Kristin Ausk of Orange County’s Meringue Bake Shop created PushCakes in 2010 by combining the nostalgia of old-school frozen treats, the classiness of a high-end cupcake and the convenience of a to-go container. Three hand-cut layers of cake are separated by three layers of buttercream frosting in scrumptious flavors, such as salted caramel, carrot, Oreo or PB&J, inside a clear push-up container. 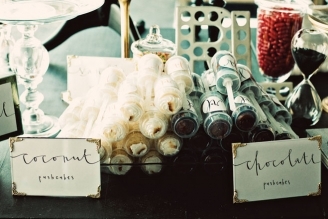 These can be served solo or make a great addition to a dessert bar and are perfect for non-seated receptions. Guests can dance and dive into dessert simultaneously. Ausk says, “They’re a fun treat you can eat [there] or throw in your purse and save for later. There’s virtually no mess.” $39 a dozen (volume discounts available), includes custom labels. Additional fees for delivery, stand rentals, gourmet flavors and package decorations. 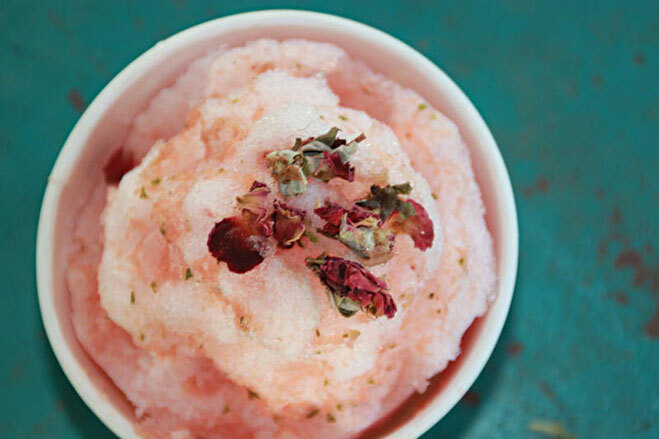 If you got a dessert problem, yo, Liz Wiltgen wants to solve it with her farm-fresh shave ice, cleverly called Ice Ice Shavie. Serving from a three-wheeled meter maid cart, this year-old company combines ultrafine ice shaved from an ice block and seasonal syrups made from locally sourced ingredients, including some from Wiltgen’s own backyard. The refreshing snack comes in flavors such as Hammer Thyme (strawberry, mint and thyme), Back in Blackberry (blackberry, lemon and basil) and Watermelon Felon (watermelon and rosemary). Alcohol can be added to get the party started. Other upgrades include custom flavors, toppings such as condensed milk or salted caramel, bartenders, and cups and spoons to match décor. $4 per 10-ounce serv- ing for three hours of service and four flavors. $150 service fee within the greater LA area; $250 for Orange County or Palm Springs. Additional fees for extra flavors, hours, alcohol and other customization. Five years ago, Glenn Panitz took dessert duty for his weekly poker game and decided to turn his favorite dessert into cookie sandwiches. “My buddies loved them so much that I thought this could be my new career.” So Panitz left real estate, spent a year perfecting his red velvet recipe and opened Studio City’s xtreme Desserts. 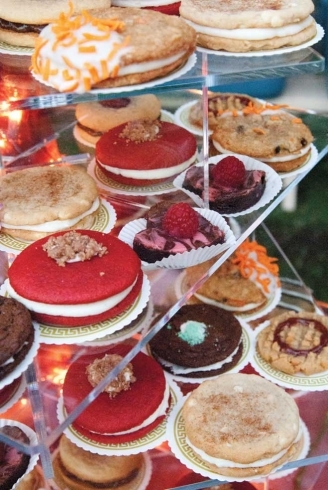 The sammies, similar to whoopie pies but with a cookie-like consistency, have since made appearances on The Cooking Channel’s Unique Sweets and at Tom Cruise’s birth- day party. Choose from two sizes (2 and a half or more than 3 inches) and 15 flavors, including key lime pie, peppermint patty, blueberry ginger crumble or chocolate chip and peanut butter. Custom frosting colors, toppings or icing (monograms are especially chic!) are an available add-on. Cookies are $2.75–$3.25 each (volume discounts avail- able); packaged favors are $4‒$10. Additional fees for setup, display rentals and delivery. 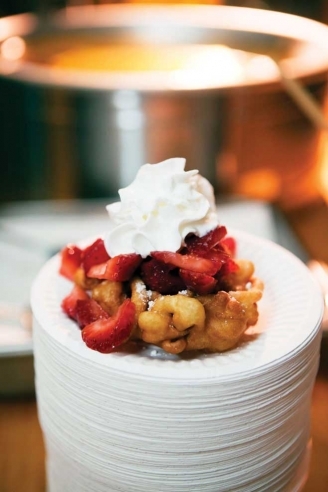 The breakfast of champions is being served in a variety of formats, including milk shooters with a fried dough ball as garnish, piled high to resemble a cake or, as recom- mended by Trumpet Vine Catering’s Jennie Sturgeon, in individual bags with cartons of milk or recyclable cups of coffee. 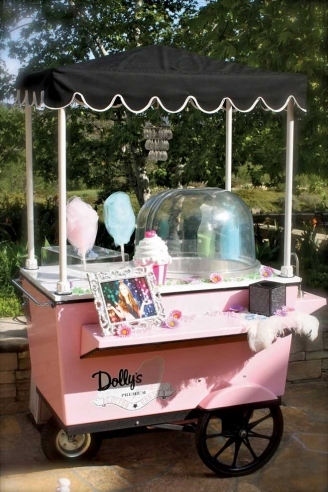 Fry Girl’s Shelley Beals offers on-site sizzle stations and food-truck service to fill your guests’ bellies with a fry-fecta of mini doughnuts, Oreos, funnel cakes and churros all over Southern California. A variety of toppings such as Vermont maple sugar, and dulce de leche and strawberry sauces are included. Two hours with one station serving as many as 300 guests starts at $1,000. Food truck begins at $1,500. Travel fees apply for events 30 miles or more from the Fry Girl warehouse.